BAFF Affiliate Networks is the one-stop solution for advertisers in need of a state of the art Affiliate Marketing CRM, using the latest tracking technology and a world-class support team. BAFF Affiliate Networks is your one-stop solution for advertisers and introducing brokers in need of a state of the art affiliate management system, using the latest tracking technology and a world-class support team. Manage Advertisers Receive traffic via API, landing pages or upload data manually priority. A full-flow affiliate management platform able to run your entire conversion funnel. Easily manage all your affiliates needs in one system. One simple API for registrations, tracking and billing. 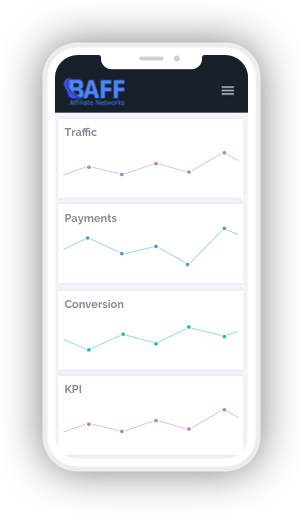 Receive, track & monitor traffic via API, funnels or just upload data manually. Easily add to your funnels our automatic smart forms. Smart, simple and complete management of all your affiliates and advertisers needs. Integrated to all industry platforms. Track leads deposits and sale statuses. Recycle Leads automatically or manually. BaffNetworks is here to help you maximize your traffic. Our one-stop solution and state of the art system enables you to integrate, track and monetize your campaigns, affiliates and advertisers’ performance. From traffic handling to affiliates management, smart remarketing tools such as drop-in emails, Facebook and AdWords campaigns tracking to comfortably monitor our leads performance. Getresponse, Facebook, Adwords, Appsflyer, Clicksure, Clickbetter. Get all the information about your system, status, performance, conversion rate and network relations with the world’s leading advertisers in one look. The only system fully compatible for mobile with built in mobile tracking, mobile Apps. 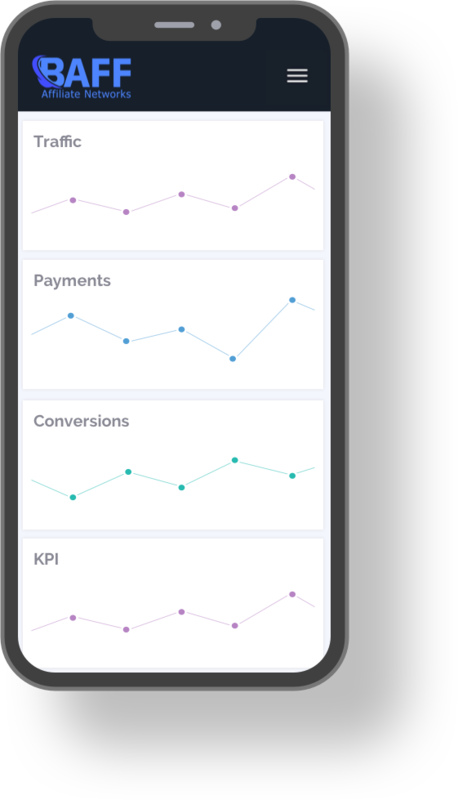 Add tracking and mobile landing pages, that enables you to track your affiliates, advertisers and your general performance from anywhere. Understand and utilize your data to increase performance, CPA traffic, networks and always be in full control of what exactly is happening in your network. With years of experience in the industry, we were tired of monitoring our traffic, campaigns, affiliates and advertisers through various systems that each is doing only a small part of what we actually need. We understood that most of our colleagues are facing the same issues on daily basis. Our team philosophy is: “support, support, support”. Our main goal is providing support at the highest level, through a dedicated account manager to 24/7/365 dedicated expert support, we are always here for you. We understand that our success is tied closely to your business success and we work by that.